When Stephen arrived in California he had already some basic self taught skills in carpentry, and a natural eye for interior design. Los Angeles would however awaken a new passion and outlet for his creativity, and help develop those gifts into a full blown hobby. Whenever he was not creating in the recording studio, he was to be found in his wood shop crafting an assortment of furnishings for the home. This platform bed and tall mirror was made with recycled wood and construction timber. The pieces below were crafted by hand from a mixture of recycled materials and construction timber, using only the most basic power tools. Stephen would faux finish the woods with multiple layers of paints eventually creating a "rustic" feel to the collection. Utilising some recycled packing crates from East Asia, mixed with construction grade 4x4 posts milled down on a table saw - SLH used the Mortise and Tenon joint technique to build the heavy duty solid base for the stools. He would again faux finish the base and use the wood from the packing crates lightly stained and waxed for the tops. Part of a series he created for his Malibu home. This portable Kitchen cart on wheels houses a spice rack / storage jar rack / knife rack / 3 shelves for various dishes / a sunken marble chopping board / a well for oils and vinegars / a book rack / towel racks and a utility drawer for miscellaneous kitchen utensils. Constructed using a variety of simple softwoods : Pine / Douglas fir and painted with a dozen layers of colours / stains / varnish / Oils and wax to achieve the final effect. A beautiful piece of pink marble from Spain was inset as a work surface to the kitchen cart. You can also see from this viewpoint the "bottle well" which houses oils and vinegars for salads etc. A vast majority of SLH pieces were built using a combination of joints, glue and screws or lag bolts, resulting in furniture that's robust, sturdy and built to last lifetime. The tall cabinet pictured in the background has glass shelves allowing light to flow from below to reveal cascading shadows over the shelves contents. The wood floors were custom cut pieces of birch laid and then faux finished with water based paint stain and ebony wood finish. 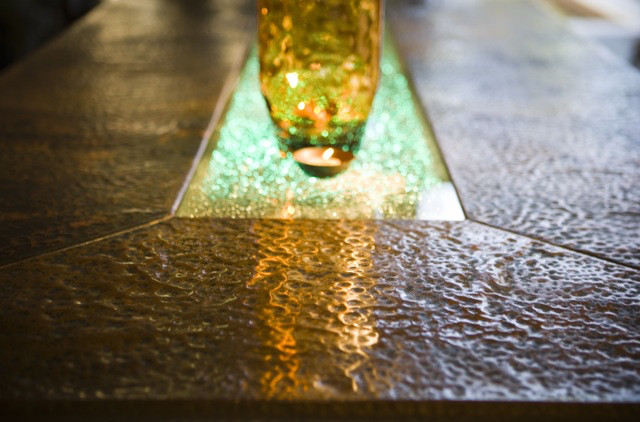 Eventually SLH would begin to incorporate other materials into his designs. 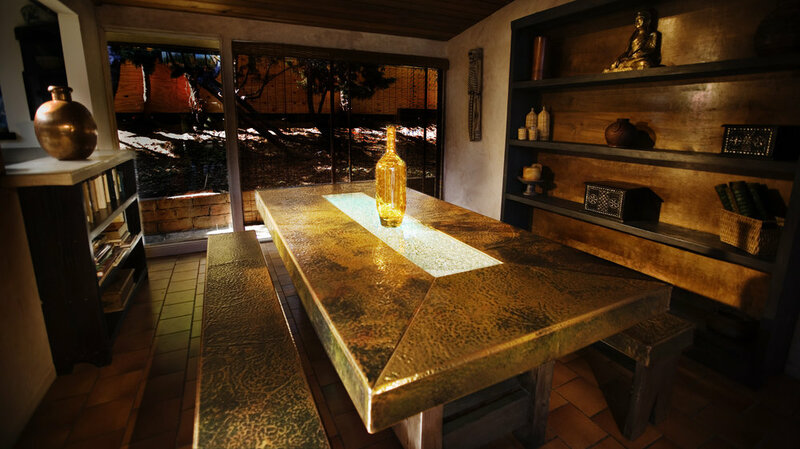 Although the base to this table continued the rustic theme at the Malibu property, the table top was wrapped in hand hammered copper, featuring layered tempered glass running down the centre of the table with the middle layer having been deliberately shattered giving the effect of a crystal when lit from below. A Californian King - with a Scottish twist. A significant amount of time and energy went into to crafting this King size behemoth of a bed. Each post has a hand carved well on top to house large candles as seen in the picture above. Constructed out of 6x6 inch solid wooden beams, the sheer weight of the frame ground it to the earth like the roots of a tree. 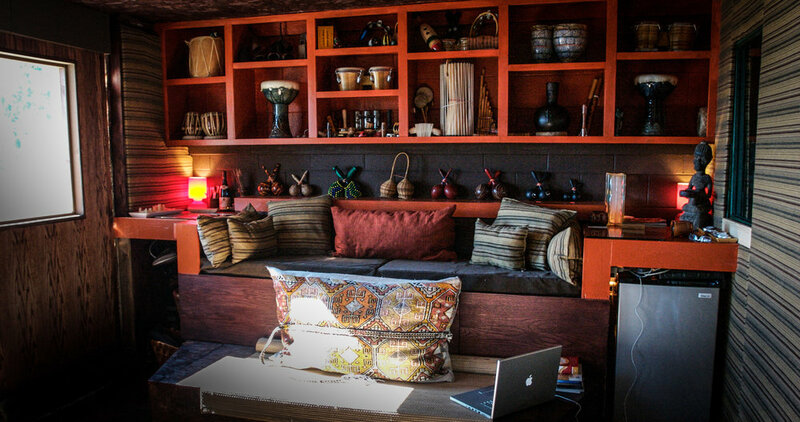 SLH continued the "rustic" theme at the Malibu property to finish it off in dark ebony. SLH designed matching bedside cabinets in solid pine wood / and matched the ebony faux finish to match the Californian King Bed. Living in Malibu or Bali or another country with a warm climate means you get to spend a lot more time outdoors - Stephen designed his own take on the 4 poster daybed to take advantage of the Malibu summers, where a nap by the pool on a hot sunny afternoon is sometimes just what the doctor ordered. Stephen would often commission artists to paint on his furniture to morph them into functional art pieces ...the artist M B Hanrahan based in Ventura, Ca painted the Daybed pictured left. Outdoor Rustic Table and Benches (pic) Christopher, Stephen's then teenage son doing his homework under the Malibu sun. The early Spanish Mission architecture and furnishings that are prevalent throughout LA, definitely had a strong influence in Stephen's designs during the early years in LA. 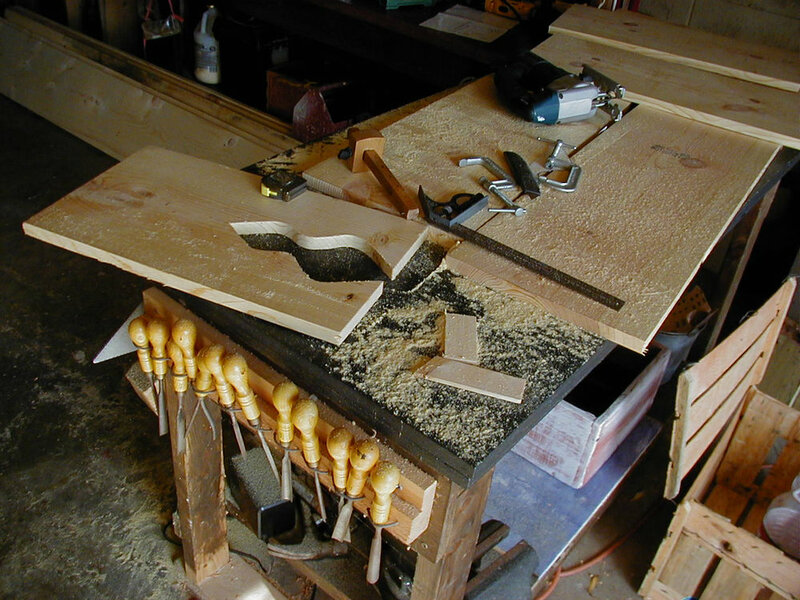 Stephen would use a simple bench saw, basic hand power tools, and a variety of hand carving chisels to create most of his designs, many of which ended up in his home or recording studios. Continuing the design theme at the Malibu property, SLH made bunk beds for his two young sons Oshean and Jual, and the Z-SOFA pictured above. As people became familiar with Stephen's work as an Artisan he began receiving "made to order" requests from local clientele in Malibu & Hollywood. likely inspired by the images of my youth, time spent in the Church or "Kirk" as it was known, what seems like multiple lifetimes ago. A taste of old Anglo Saxon Britain. I sat carving away at this in a primitive fashion and then left the frame out in the sun and rain for months. I painted it over a dozen times, sanding and beating it up between coats spilling glue on it for a crackle glaze effect in places, until finally coating it with several shades of wood stain and varnish, until it had this heavy aged finish. SLH designed and built Beta Records recording facility in Hollywood, California. Upon the projects completion he produced the Temptations album "Back to front" in the studio that summer. 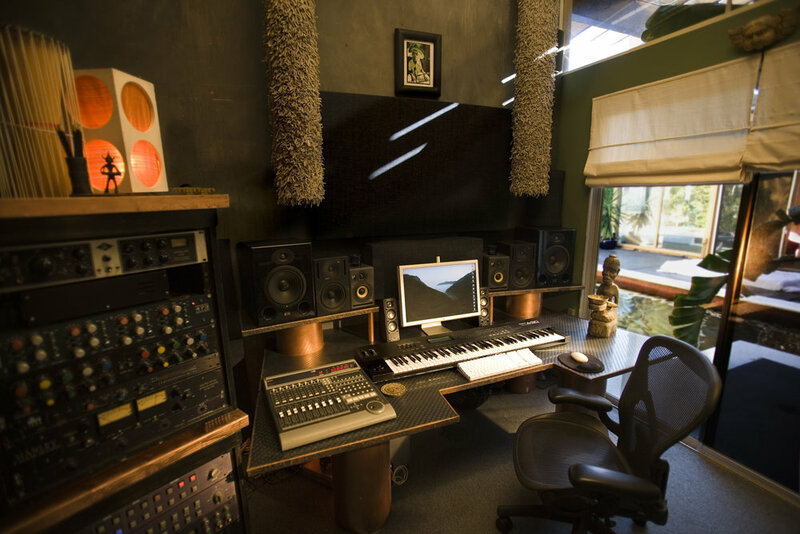 Stephen's first studio in Malibu was built in one of the rooms in the house facing the pool, also with an ocean view. For several years he churned out numerous projects from this space. Later he would expand and build Studio 2 in the basement of the house to facilitate recording full band set ups. For MusicyardMalibu (studio 1) Stephen went with a modern feel avoiding any rustic elements, using instead a plywood structure with copper finished cylindrical pipes and industrial linoleum as a finish completing the pieces with hand hammered copper trim accents for a stylish semi industrial modern look. The installation of studio two called for a very creative approach to the design, construction and materials used. It was imperative to have the studio completely isolated for sound as it faced the main road overlooking the ocean. Each isolation booth had a view to the Pacific via four windows that were coated as one way glass to only see outwards.